The Sheffield Doc/Fest has confirmed the 65 documentary teams selected to pitch at the event's flagship MeetMarket. Chosen from over 500 submissions, the projects include a Michael Moore-exec produced documentary on film director Orson Welles and a Cuban sports film from Dan Gordon, the director of Hillsborough. Five external industry leaders decided the shortlist: Margje de Koning (Head of RTV & New Media, Evangelische Omroep), Salma Abdalla (CEO & Theatrical Sales, Autlook Films), Danny Horan (Commissioning Editor, Documentaries, BBC), Ryan Harrington (Director, Docs & Specials, Discovery) and Rebecca Lichtenfeld (Director of Social Impact Media, Bertha Foundation). 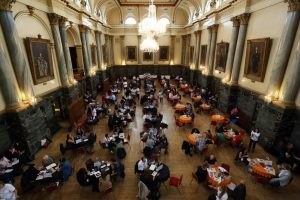 The MeetMarket and the Alternate Realties Market - which includes 25 project teams - will will take place over two of the festival days, June 12 and 13th, at Cutlers' Hall in Sheffield. See the full list of selected projects here. Last month we revealed how a performance of Daisy Asquith’s Queerama will open proceedings at the world-renowned event.